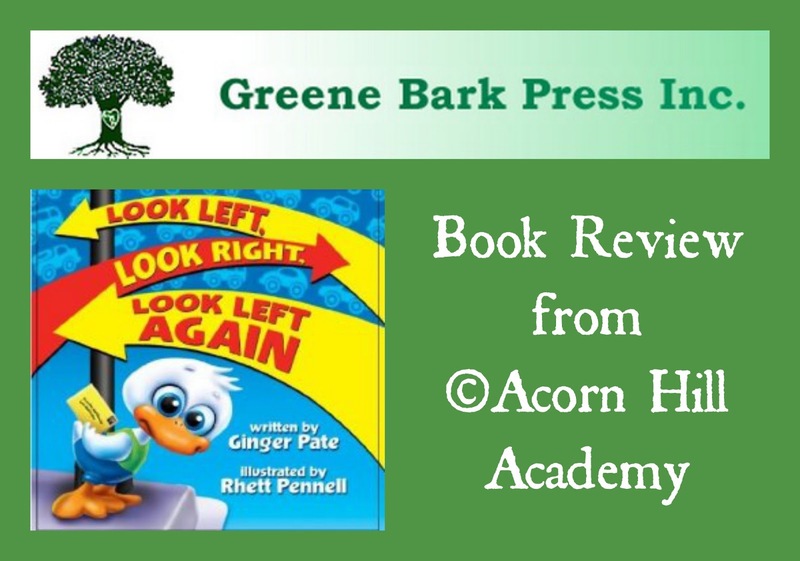 I wasn't sure what I would think of this little board book from Greene Bark Press: Look Left, Look Right, Look Left Again. I'm on my third child, after all, and felt I should probably be able to manage teaching him how to cross the road without too much trouble. When I thought about it, though, I realized I hadn't worked on how to safely cross the road with him very much. We live in a neighborhood with only one entrance. There is very little traffic, and the drivers go slowly and watch for people all the time. We walk around the neighborhood, on the only road which is a circle, but we haven't had much opportunity to practice actually crossing a road. Additionally, this third child of mine is rather independent. He's fairly confident he can to handle himself in any situation, whether he's had the experience before, or not. So, when the opportunity came to review this board book, I asked if I could take a look. It's a quick-reading story about a little duck named Wally Waddlewater. He wants to mail a letter to his grandmother, but has to walk quite a ways to find a mailbox. He would like to go by himself, but his first attempt to cross the street doesn't go so well. He looks one direction, but not the other, and nearly steps out in front of a car. His mother is there to help him, and she guides him again through all the steps to crossing the street safely, including - even looking around any obstacles that might be in the way, blocking the view of the oncoming traffic. That's one thing we laugh about - "Isaac, are there any elephants in the way? No? Then we're good." We are all about the fun at our house! When Isaac and I read this book together, we enjoyed it. I thought he might be a little old for the book, but I was pleasantly surprised by how much he liked it. First of all, it rhymes, which makes any story more fun to read. Secondly the rhyme for crossing the street is easy to remember, and Isaac likes to say it with me when we talk about crossing the road. "Remember what Wally learned? 'Look left, look right, look left again.'" It's much less confrontational than "ISAAC! WAIT FOR MOM BEFORE YOU CROSS THE STREET!" Heh. This is a great book for any child to learn crossing the street. It seems like such a basic thing, but little kids get told to do a LOT of things. It's nice to have a book that teaches them important concepts in a fun way. It would have been great to have this when my girls were little and we lived in a busy neighborhood. I could see this book being well-received in preschools. 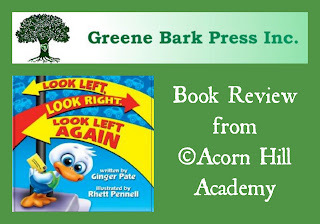 Look Left, Look Right, Look Left Again is an award-winning finalist from the International Book awards, which is a division of USA Book News. It's intended for children ages 3-8. It is available from Greene Bark Press for $8.50.